Nearly three years later, the Mac mini has been updated for the first time since 2012. Improvements include fourth-generation Intel Core processors and Intel Iris and HD Graphics 5000, which is a nice improvement compared to the previous generation having HD Graphics 4000 as the only option. PCIe-based flash storage, faster 802.11ac Wi-Fi, and – finally – Thunderbolt 2 ports will also make an appearance on Apple’s latest tiny desktop. The new Mac mini will be available today starting for just $499. That’s $100 less than the previous starting price, although it’s unknown at this time whether this reduced price will be for a comparable baseline configuration. 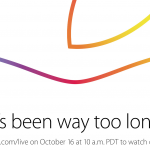 We’ll let you know when Apple’s online store is back up later today, which is when the machines will be available.